I want to share my DxDiag for the laptop I find myself using more often. Performance in TDM, even after 2.05 is pretty crap. I was thinking to remove any FPS cap to help it. Real problems surface with particles and things like that. What was the catch with the perforamance boosters planned for 2.05? How many people feel it had a significant outcome for them? The wiki has helpful customization to manually do the sunrise and get the settings down for low performance PC's, but I wonder if I'm missing something. Games such as Vampire the Masquerade: Bloodlines ran quite decently and this isn't a PC that old, especially Doom 3 engine wise. Not expecting amazing horsepower, but still, 10 FPS at any scene with particles? Is the above running under 2.05..? and which "Intel HD" chip is it, the HD 3000...? if so you gonna have a hard time running most games under that GPu. Yes, just updated to 2.05. It says on the ticket "Intel Dual Core B830 1.8 Ghz. I presume the only solution than is to find time to manually configure and remove particles. Are there any plans to make extreme low settings like these available in the game settings? For low perf. PC's they look quite limited (at least if making the game available to those PC's is in plans at all). Edited by Anderson, 18 February 2017 - 12:41 PM. But may I suggest to please create a separate topic for further discussion? 1.8ghz is going to struggle with vanilla Doom 3. The Dark Mod is heavier still. That said, I would like to check your Darkmod.cfg, so please post it with a txt extension. Do you mean in regards to more fixes for low perf. PC's? Edited by Anderson, 19 February 2017 - 03:25 PM. I am myself stuck with a mobile Intel 15W chip. It's not as bad as the 4W chip I had before but still not enough for 30fps at 1080p. Mine is a 14nm chip, while yours is 32nm, so it is probably as slow for you at 768p. The fbo thing I've been sporadically working on recently is designed specifically for low end systems like mine. I've been thinking about an option to skip particles at all for a long time now, but my knowledge of engine and especially of mapping concepts is very limited. What we don't know is how high up in the priority list such changes for option customizations are for the team. We saw how slow, unpredictable and difficult any ETA is for releasing future patches in reasonably defined timelines can prove to be. Please do not use these changes. I think I have some good news in terms of CPU scaling. Until recently, I had an old 1st gen i7 950@3.02 GHz, paired up with 16 gigs of RAM @ 1000 MHz, with GTX 1060 in 1440p native resolution. Any mission having more than 3500 drawcalls per scene made the framerate go down below 60 fps. Other factors scaled up pretty well, perhaps due to relatively new GPU (300k of shadow tris seemed impressive, where the recommended value is 80-100k). seems plain wrong for my new configuration, for both TDM 2.05 and 2.06. 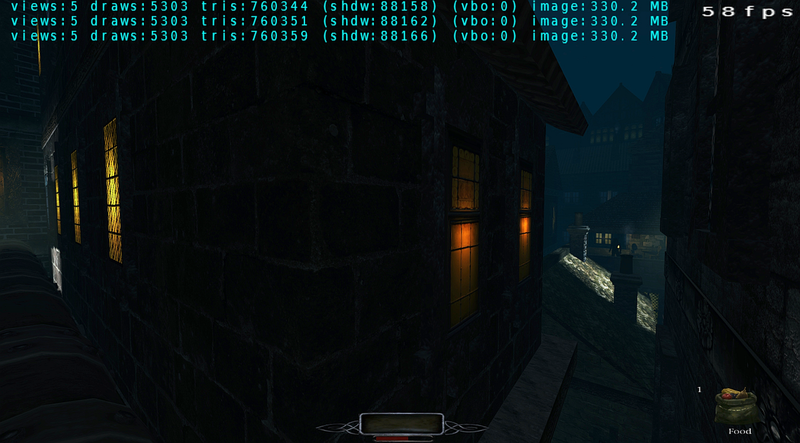 When I disable threaded optimization, the framerate in Briarwood Manor tanks to 25 FPS again. Added a footnote about that. Are these with uncapped FPS and multi-core enabled? Yup, I used com_fixedTic for TDM 2.05 as well. IMO it would be great to ask other forum members with Nvidia cards to toggle between Auto and Off for Threaded optimization, and to note their results (using com_showFPS or other frame rate meter). By the way, it seems that newer Nvidia drivers (my version is 398.36) don't have Multi-display/Mixed GPU acceleration option available any longer. Edited by Judith, 08 August 2018 - 08:50 AM. If you enable multi-core support in 2.06, then TDM uses two threads which both have their own OpenGL context and talk to the driver. It's little wonder that disabling threaded optimizations would be hurtful in that scenario. Might be more interesting to try that with one of the experimental 2.07 builds, though. Those have eliminated the secondary context, so they might behave differently. IMO the weirdest thing is that it actually impacts performance on 2.05, which uses only one core. That would mean changing the option messes up the cpu>gpu pipeline somehow. Threaded Optimization takes the GL calls by the engine and attempts to rearrange them to be submit in parallel. or do not take advantage of parallel rendering very well. Nvidia does all sorts of magic in their drivers in this regard. on AMD hardware this was a nice increase whereas Nvidia had performance loss because it already does this internally in the driver.